Michigan's largest amateur star party. Travel 11 miles N. from Loomis Exit. Travel 6.5 miles E. from Lake George Exit. From M-61 travel 2.5 miles S. on Bailey Lake Ave.
(Midway between Gladwin and Harrison). Observing hill location and park layout may be found here. 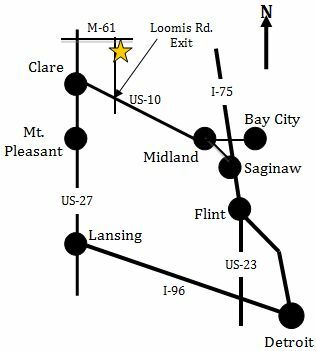 The Great Lakes Star Gaze Michigan star party is open to anyone. Come chat with other star lovers and astronomers while you enjoy the night sky like never before. Copyright (c) Great Lakes Star Gaze. All rights reserved. Template provided by Free CSS Templates.